The longlist for the Short Story Day Africa Prize for Short Fiction has been announced. The prize was founded in 2013, and is open to any African citizen or African person living in the diaspora. SSDA awards prize money of US$800 (about R11,000) for first place, $200 for second place, and $100 for third place. The previous winners of the prize are Tochukwu Emmanuel Okafor, Sibongile Fisher, Cat Hellisen, Diane Awerbuck and Okwiri Oduor. This year’s prize theme is ‘Hotel Africa’ . 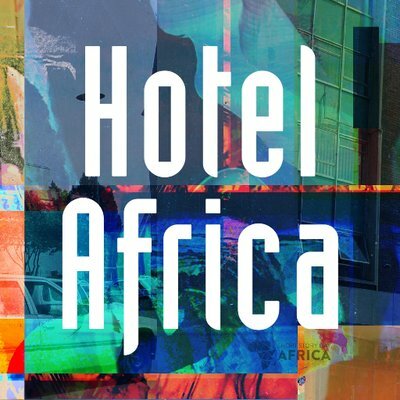 The resulting anthology from the longlisted entries, Hotel Africa: New Short Fiction from Africa, will be edited by Helen Moffett, who will select three editing fellows to work alongside her as part of the SSDA/Worldreader Editing Mentorship, now in its third year. ‘This year’s longlist was particularly difficult to decide’, SSDA Executive Editor Rachel Zadok says. ‘Like last year, the slushpile was read by a team of professional editors with an eye on development, so that no talent, no matter how raw, was overlooked. Instead of looking simply to the most polished stories to make up the list, we looked at the originality of the story. We looked for that sparkle in a writer’s voice that’s almost impossible to define, but when you see it, it creates a buzz in your brain. Of course, this doesn’t mean that there are no polished writers on the list, just that the playing field was more equal. The stories on the longlist each explore the theme in unique and fascinating ways. ‘We’re also seeing a greater number of stories from previously under-represented countries. It’s wonderful to be publishing writers like Adam El Shalakany from Egypt, who has entered the SSDA Prize in the past but has never been placed. His story “Happy City Hotel” was one of the unanimous decisions, of which there were only six out of the twenty-one. After months of reading, which culminated in three and a half hours of deliberation, arguing and tears, each of us walked away a little heartbroken for the favourites we had to sacrifice. So to the writers who didn’t make the list this year: don’t give up. We’ve got our eyes on you. Congratulations to the twenty-one long listed writers! Meet the 2019 SSDA Editing Fellows! From left: Agazit Abate, Anne Moraa and Ope Adedeji. Agazit Abate (Ethiopia) is the daughter of immigrants and storytellers. She was raised in Los Angeles. She writes and lives in Addis Ababa. Anne Moraa (Kenya) is a storyteller. A writer, performer, and editor, she most recently she co-wrote, produced and performed in the critically acclaimed, "Too Early For Birds: The Brazen Edition", a stage play that uninvisibled invisible women in Kenya's history, as part of the LAM Sisterhood. Her writing has been published in Meridians, Jalada, The Wide Margin, and in Short Story Day Africa’s anthology Migrations. A founding member of Jalada Africa, she is an Amplify Fellow and Mawazo Novel Writing Fellow. She is currently at work on her debut novel. Find her on Twitter @tweetmoraa. Ope Adedeji (Nigeria) is a lawyer, editor and writer. She dreams about bridging the gender equality gap and destroying the patriarchy. Her work has appeared on Arts and Africa, Afreada, and Catapult. She was shortlisted for the 2018 Koffi Addo Prize for Creative Nonfiction, and is an Artist Managers and Literary Activists fellow. She is an alumni of the 2018 Purple Hibiscus Trust Creative Writing Workshop. She currently works at Ouida Books, where she is the Managing Editor. If you do not find her reading, you’ll find her writing. Find her on Twitter @opeeee_. Congratulations and we look forward to working with you! We were overwhelmed by the response to our call for applications for the SSDA editing mentorship programme, a part-time opportunity to edit the annual SSDA anthology under the tutelage of the the Editing Mentor, Helen Moffett. FIFTY-SEVEN applications came pouring in. We were so impressed by the enthusiasm and talent that showed up in our inboxes that in the end we created an extra position, which is made possible by the addition of an extra mentor, Karen Jennings (introduced below). We wish there was some way to take everyone – every single applicant had something to offer. They came from all over Africa, and from people in a wide variety of interesting jobs: from medical doctors to environmental waste engineers to rugby coaches. A significant number of the applicants were impressively over-qualified, which isn’t intended to sound at all patronising, but is testament to the fact that so many share SSDA’s vision that editing in Africa needs support and development, and that this needs to be provided right here at home. One thing everyone had in common was a passion for African literature in all forms, and all were avid readers and writers. Choosing the Fellows was immensely difficult. Our brief is to develop editing abilities and capacities on the continent. So in the end we chose candidates who already have some experience in or are currently working in anglophone African indie publishing, and have the potential to make a full-time and long-term contribution to the art and craft of fiction publishing in Africa. And even that was an impossible task, as many met these criteria. We hope that this experience will enlarge our pool of volunteers, a small but valiant group who offer everything from reading, admin tasks and proofreading, to advice and encouragement. It’s also clear that there is a great need for a series of online continent-wide fiction editing courses. However, this will involve additional fundraising efforts in an extremely pinched funding environment (simply keeping our core function going is an ongoing challenge), and will take some time to set up. But we have plans, and will keep you posted. Karen Jennings (South Africa/Brazil) is a long-standing friend, and we are delighted that she has offered to come on board to support Helen and share her insights with the editing team. Her story, “Keeping”, was published in Migrations, and she edited the first SSDA anthology, Feast, Famine and Potluck, which went on to produce two Caine Prize shortlistees, including the ultimate winner. She has edited for indie South African publishers and imprints, including the acclaimed Tjieng Tjang Tjerries by Jolyn Phillips, for Modjaji, and Nkosinathi Sithole's Hunger Eats a Man, which won the Barry Ronge Sunday Times fiction prize. She is no slouch as a writer, either: her debut novel, Finding Soutbek, was shortlisted for inaugural Etisalat Prize for African Fiction. In 2014 her short story collection, Away from the Dead, was longlisted for the Frank O'Connor International short story competition. She holds Masters degrees in both English Literature and Creative Writing from the University of Cape Town, as well as a PhD in English Literature from the University of KwaZulu-Natal. Strangely enough (or perhaps not), when first starting out as an editor, she was mentored by Helen, so this feels like closing the circle. Rachel Zadok taking an ID selfie in the reflective limited edition cover. We love books. If we didn't, we wouldn't be running this project. We love books so much we want our anthologies to be loved by our readers. We want them to be cherished. We want readers to pet them. We want their cats to get jealous. As a collaboration, the content of SSDA books is partly up to us, the curators, but mostly up to the brave and imaginative writers who trust us with their stories. The rest – the editing, typesetting, cover design – is in our hands, and we want to honour the content you create with exceptional editing, design and a cover that encapsulates not only the pages, but the ideas they hold. It's not an easy task. ID features twenty-one writers from all over the continent, with their own languages, cultures, viewpoints and ideas. (No, dear foreign reader, we Africans are not all the same.) Twenty-one stories sparked by a single idea and interpreted in a multitude of ways. A range of prose styles and tones that range from humorous to tragic, with every modulation between. When we discussed the 2017 theme, ID, we decided to use the symbol of a barcode as a launchpad for ideas by writers, and this informed the initial beautiful cover concept by Nick Mulgrew, exquisitely interpreted and designed into a cover by Megan Ross. We even incorporated a barcode into the endpapers. Then we debated long and hard about whether to foil the cover (i.e., create a metallic finish). We knew this was risky – foiling a big area means that the cover is likely to get scratched, but we figured what makes us human if not our flaws? If we gloss-laminated the foil to protect it, we would lose the stunning effect in which the reader picks up the book and sees their own face mirrored in the cover – another play on the concepts of identity and id as part of ego. Yet books with scratched covers would not sell well in bookshops, as browsers and salespeople might think they were shop-soiled (instead of us being maybe a bit too clever for our own good). So we decided to do a limited print run of one hundred foiled unlaminated covers, which will be stamped with a special ID brand and numbered. These will be sold at the launch and sent to the writers who contributed. They’ll become collectors’ items to be treasured, so contact the Book Lounge if you want one of your own and you might get lucky. The rest of the print run will be gloss laminated, and just as lovely to look at. Boykie models with ID, a book he feels is great partly because of his valuable contribution. 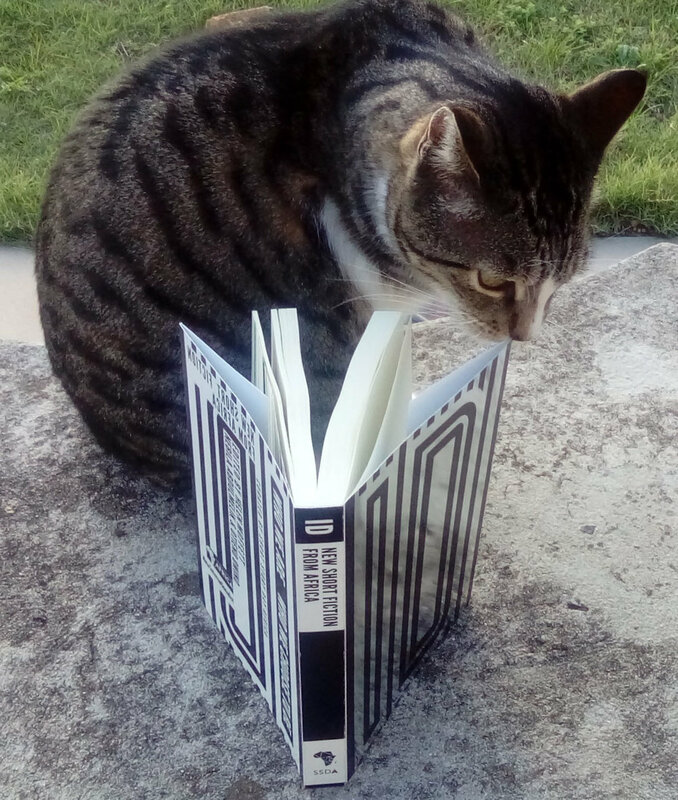 Something that struck the editing mentor, Helen Moffett, was how the colours and stripes of the cover image matched the coat of her new rescue cat, Boykie, who was found injured to the point of death by the side of the road last year. His amazing recovery and adaptation to life with three legs coincided with the long journey to get ID into final shape and form. All through the summer, autumn and onset of winter 2018, as she worked with the enthusiastic and diligent editing mentees, Otieno Owino and Nebila Abdulmelik, and then with twenty-one authors, through all the to and fro of the stories and questions and rewrites and emails, Boykie rolled around on her keyboard or sat peering at her computer screen, “helping out”. In the process, he became the ID mascot, always inspiring and cheering on the editors. Here are some pictures of him admiring the incredible book – original, unique and handsome, both inside and out – the writers and SSDA have had the pleasure of creating. Boykie carefully checking the ID book proof. The limited edition will be on sale at the launch on Thursday 5 July at the Book Lounge. To reserve a copy call the Book Lounge on 021 462 2425. Announcing the winners of the $800 Short Story Day Africa Prize for Short Fiction. Tochukwu Emmanuel Okafor has won the prestigious 2017 Short Story Day Africa Prize for his story, "All Our Lives", his multiple-identity story examining the lives of disaffected men who drift into Nigerian cities in pursuit of a "better life". The judges described Okafor's "All Our Lives" as wry, cleared-eyed, humorous and compassionate. Tochukwu Emmanuel Okafor is a Nigerian writer whose work has appeared in The Guardian, Litro, Harvard University’s Transition, Warscapes, Columbia Journal, and elsewhere. A 2018 Rhodes Scholar finalist, he has been twice nominated for the Short Story Day Africa prize and the Pushcart Prize. His writing has been shortlisted for the 2017 Awele Creative Trust award, the 2016 Problem House Press Short Story Prize, and the 2016 Southern Pacific Review Short Story Prize. A two-time recipient of the Festus Iyayi Award for Excellence for Prose/Playwriting, he is currently a 2018 Kathy Fish fellow and writer-in-residence at Smoke-Long Quarterly. This is the first time in the prize's five year history that a man has won. Okafor will receive $800 prize money. This year saw a change in the reading and judging process, as outlined in the long list announcement here. The new and more democratic approach to voting gave us two stories in second place. Joint runners-up for the 2017 Short Story Day Africa Prize are Agazit Abate for her story "The Piano Player" and Michael Yee for his story "God Skin". Judges described the “The Piano Player” as a brilliant inversion of the “African abroad” narrative as it presents snapshots of life in Addis Abada through the eyes and ears of a pianist in a luxury hotel bar. “God Skin" by Michael Yee weaves together alienation, forbidden love and intimate violence against a subtle backdrop of the scars of Liberia’s civil war. Agazit Abate is the daughter of immigrants and storytellers. She was raised in Los Angeles, and writes and lives in Addis Ababa. Michael Yee is a South African writer born in Pretoria. His writing has appeared in the Short.Sharp.Stories anthologies. Agazit and Michael will each receive $150, a 50% split of the prize money allocated for second and third place. All three winners have been participants in SSDA Flow Workshops, held by Short Story Day Africa in partnership with the Geothe-Institut. The winning stories are published in ID: New Short Fiction from Africa, edited by Helen Moffett, Nebila Abdulmelik and Otieno Owino. ID is a collection of the twenty-one long listed stories from the 2017 Short Story Day Africa Prize for African Short Fiction, and will be available as an e-book in Africa later today. ID is co-published by Short Story Day Africa and New Internationalist. The winning stories will be available to read online in the 2 July issue of The Johannesburg Review of Books. Short Story Day Africa is pleased to announce the shortlist for the $800 Short Story Day Africa Prize for Short Fiction. We were impressed as never before by the multiple ways in which writers from all over the continent responded, the depth, variety and innovation of their interpretations. From Benin to Ethiopia, from Morocco to South Africa, the stories on the long list reveal uncomfortable and fascinating truths about who we are. Once editing was completed, the twenty-one stories were sent to the judges. The decision to edit the stories and to engage with the authors before judging has proven to be invaluable in enabling young writers and raw talent to compete on an equal footing with their more established and experienced peers. The final stories and indeed the shortlisted stories are more evenly balanced between those already making their mark in terms of publication and awards, and extremely talented writers who are new to the adventure of publishing or only just venturing into the terrain of short fiction. This year, for the first time, we opted for a broad spread of volunteer judges, ably assisted by The Johannesburg Review of Books, rendering the evaluation process flatter, more consultative and democratic. The combination of the new scoring system and the extremely high standard of the stories meant that for the first time, we’ve produced a short list of nine stories, instead of the usual six. Seen here are a variety of explorations of queer sexuality – an extremely important and necessary creative intervention, given the grim march of homophobia, including in legislative forms, across the African continent. Michael Agugom charts the challenges of negotiating biracial and sexually complex identities in a small and watchful Nigerian island community in “Ibinabo”; and Cherrie Kandie provides a powerful and painful account of the silencing (literally) of lesbian love in urban Nairobi in “Sew My Mouth”. In “The House on the Corner”, Lester Walbrugh provides a moving interpretation of the perhaps ubiquitous “gay life in Cape Town” narrative; Innocent Chizaram Ilo provides a delightfully unusual and fantastical account of heartbreak as experienced by a lesbian scarecrow in “Limbo”. Michelle Angwenyi’s lyrical and hallucinatory “The Geography of Sunflowers” presents heteronormative love and loss as experiences that both heighten and blur identity. Identity is also formed through friendships and family bonds, and in Farai Mudzingwa’s delicate and moving “South of Samora”, a young man whose social standing is dependent on where he lives, forms a friendship with an ailing child that forces him to define himself; while Tochukwu Emmanuel Okafor's “All Our Lives” is a wry, clear-eyed, humorous and characteristically compassionate account of the identity (multiple identities, in fact) of a much-maligned community – young and disaffected men who drift into Nigerian cities in pursuit of a “better life”. “The Piano Player” by Agazit Abate is a brilliant inversion of the “African abroad” narrative as it presents snapshots of life in Addis Ababa through the eyes and ears of a pianist in a luxury hotel bar, and “God Skin" by Michael Yee weaves together alienation, forbidden love and intimate violence against a subtle backdrop of the scars of Liberia’s civil war. Congratulations to all the shortlisted authors. The winners will be announced on 21 June 2018, the shortest day of the year in the southern hemisphere. The grand prize winner is set to win $800. A full list of project sponsors is available on our sponsors page. The resulting anthology from the longlisted prize entries, ID: New Short Fiction From Africa, is edited by Nebila Abdulmelik, Otieno Owino and Helen Moffett as part of the SSDA/Worldreader Editing Mentorship. ID is due for release on 21 June 2018, in partnership with New Internationalist. All of SSDA’s previous anthologies have received critical acclaim, with two stories from Feast, Famine & Potluck shortlisted for The Caine Prize for African Writing – with one, “My Father's Head” by Okwiri Oduor, going on to win the prize. Terra Incognita and Water likewise received wide critical praise, including reviews from the Los Angeles Review of Books, the Sunday Times and the Financial Mail. Stacy Hardy’s story “Involution”, published in Migrations, is shortlisted for the 2018 Caine Prize for African Writing.